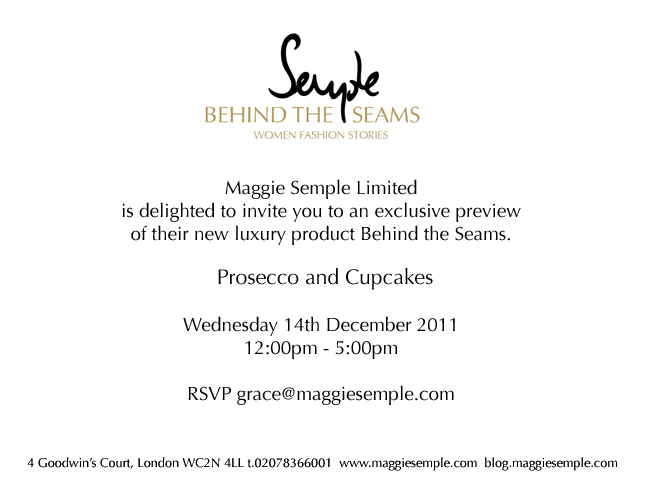 Maggie Semple Press Day-You are invited! Maggie Semple Limited are pleased to announce the launch of their latest product, Behind the Seams, a new luxury gift service that provides a unique piece of fashion history about a treasured garment. Every woman has at least one item of clothing that they cannot throw away and since October 2010, Maggie Semple Limited have been celebrating the history of these fantastic garments. On Wednesday 14th December 2011, the MSL team (including myself) invite you to their first ever press day for Behind the Seams allowing you an exclusive glance at the product itself. If this is not enough to entice you then we are offering Prosecco and customised MSL cupcakes along with an exclusive MSL surprise for you to enjoy. Behind the Seams is a unique and entirely custom-made service that captures the precise moment of fashion history that links to the personal experiences of the wearer; a precious story that can be passed on to future generations of fashion lovers, an exclusively tailored timeless gift. To attend the press day, please RSVP to the email on the invitation. We all look forward to seeing you all there.